This baby unicorn with his impossibly-long legs will be treasured for years – and yes, you can make it yourself. Attach the pattern pieces to cardboard. Put the pieces together to form the armature for your bunny. Add rounded shapes with crumpled foil and hot glue. The instructions show you how. Cover the armature with a very thin layer of Apoxie Sculpt, like I did, or use either traditional paper strips and paste or the air dry clay recipe that you can find in the Art Library on this site. Paint him with acrylic paint. 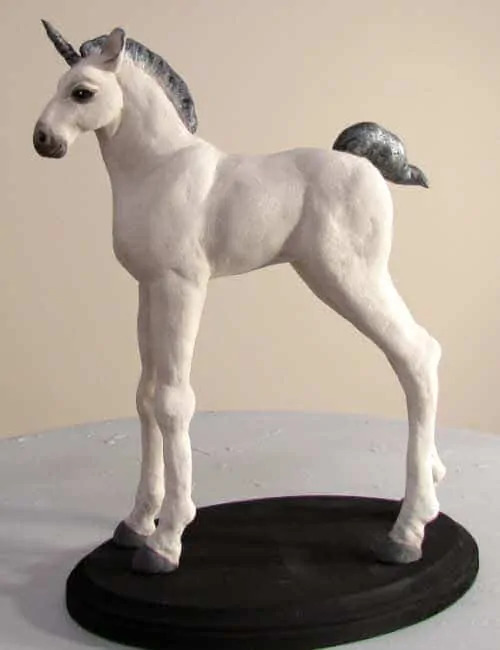 The baby unicorn shown above was made with one pound of Apoxie Sculpt. In fact, there was enough left over to make his friend the Mini-Bunny, too. I painted mine with chalk paint, which gives it a nice soft coat – but any acrylic paint will work. You can see how I made the solid white coat a little more interesting in the video below. 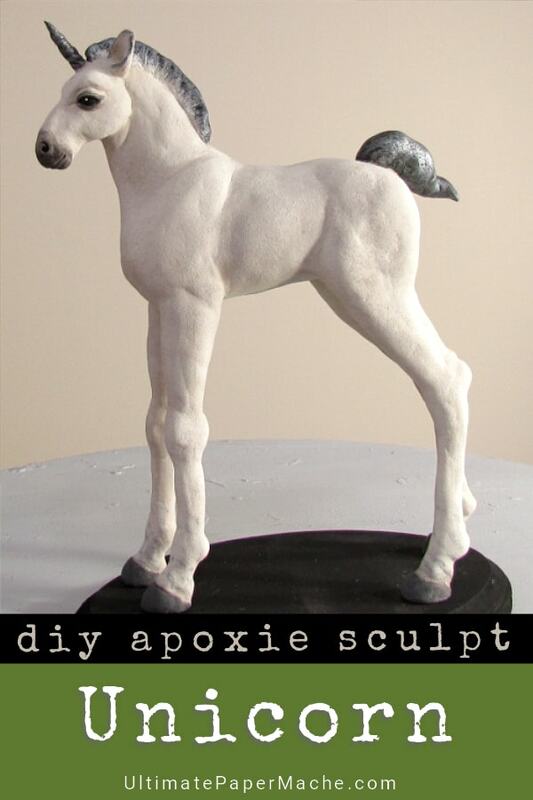 One pound of Apoxie Sculpt, or a batch of the air dry clay recipe that you’ll find in the Paper Mache Art Library. Golden Acrylic Glazing Liquid (optional. Amazing form and anatomy of the unicorn. I realize this is a foal and a bit smaller throughout its anatomy, the abdomen is a bit flat but your line is still amazing. I would’ve loved to see some pink undertones beneath the thinner areas of fine white hair and around the ears and brought more contrast against the black or salt and pepper mane. Thank you for sharing. Love your site! My First time here! I’ll be back. If you make one, I’d love to see how it looks with those changes in the coat. They sound lovely. I do hope you’ll hurry back. Oh dear – I made those using a computer program, and I’m not sure I could remember how to use it. But we all saw your zebra, so we know you can make a beautiful giraffe, too. Try using the crumpled foil instead of crumpled paper – it will feel more like you’re working with clay because it doesn’t fight you quite as much as paper does. I made my giraffe years ago. If you want to see how the armature was made click here. And when your giraffe is finished, be sure and let us see how it turns out. Oh my goodness Mrs. Good!!! I did my first paper mache animal about 15 years ago. I never used patterns. I probably sound very ignorant right now 😀 but I honestly had to look at at this video to understand what it is that you are selling when you mentioned “patterns”. You are so honest and open about everything, and you are a very charming, likable person. I love your site and videos! Thanks, Yvette. 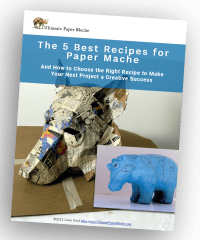 I couldn’t find anyone who used patterns inside of their paper mache sculptures until I started doing it. I think I might have invented the idea, although it makes things so much easier I can’t imagine why people weren’t doing it before. Thank you so much for your kind comment about the site and the videos – I’m glad you’re enjoying them! I just love the, Jonni. GREAT job! Thanks for sharing how you make your artworks! amazing idea !! 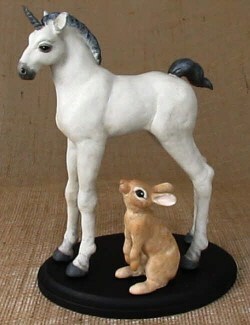 Absolutely adorable, I love this little fella and bunny, and your tips for making proportioned animals, so clear. I hope you complete the Pegasus and how you make your wings will be fun to watch. Can’t wait for our rainy season to end now, it has to be a Spring thing for me just due to lack of space in the house. Ultimately I want to make yard installations, fantasy creatures that blend into the garden path and beds. Now to the drawing board. You do such great work, very inspiring. Happy New Year! Thanks, Susan. I love the idea of fantasy creatures peeking out in a garden, as if they were actually living there. What material will you be using to make your garden sculptures waterproof? Jonni, I love the unicorn! So beautiful! GREAT job! Thanks for sharing how you make your artworks! You’re welcome. I’m glad you’re enjoying the site. Thanks, Cherie. Happy new year to you, too! Do you have any big projects planned? Not at the moment. We are planning to retire to a small cottage in Wales… If we can find one that we like enough to give up our home here for. That sounds exciting. Just looking will be fun, even if you don’t find exactly what you’re looking for right away. Good luck! Jonni, My what a masterpiece! You are really talented and you put so much thought into your sculptures. I loved your explanation of how you do the various poses and was delighted to realize that I do that too and never realized it! You obviously imparted that wisdom without even directly addressing it because I learned everything from you. The pattern is sure to be a hit and congratulations on completing it….wow, 35 pages! If you are ever inclined to do yet another video on this baby unicorn, have it about the paint job. You did a masterful job. White is very difficult to do because it is never all truly white and it is difficult to make white look realistic like you did on this guy. Where will this sculpture reside? And in case I have not thanked you recently, thanks for all you do. As soon as the varnish that Rex suggested arrives, I’ll probably finish them and put them on top of my bookcase. 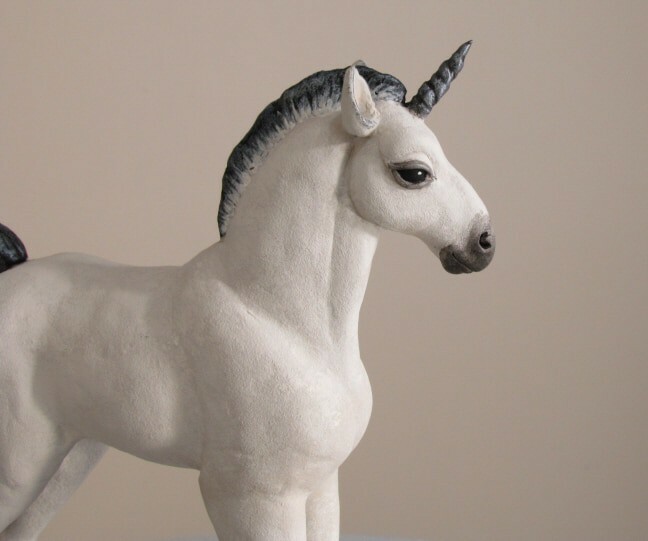 Eileen, I posted a video showing how the unicorn was painted. It’s a very simple technique, really, using Chalk paint and a stencil brush. You can see the video here.